X-Plain for Patient Portals gives patients a highly engaging experience within the patient portal. When users log into a patient portal, they gain access to patient-specific programs about their health conditions and any recent or scheduled procedures. Patients can also browse the X-Plain Health Encyclopedia for topics of interest. They can then read about the topic, watch a video, or complete an interactive learning session. How is X-Plain for Patient Portals used? After the patient logs into the patient portal, they will see a list of their medical conditions, procedures, and medications. To access a list of relevant patient education materials, the patient will click on the Infobutton next to their conditions and procedures. A list of relevant patient education topics will appear. 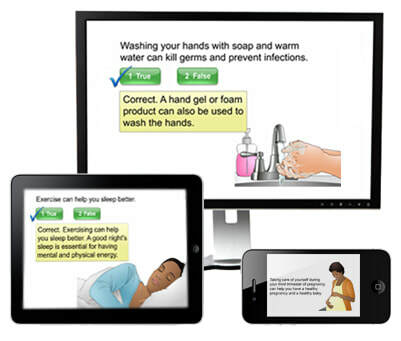 When the patient clicks on one of the topics, the patient then chooses his or her preferred educational format (illustrated text, video, or tutorial) and language. They can then read about the topic, watch the video, or complete the interactive tutorial. What if my patient portal does not connect to the EMR? 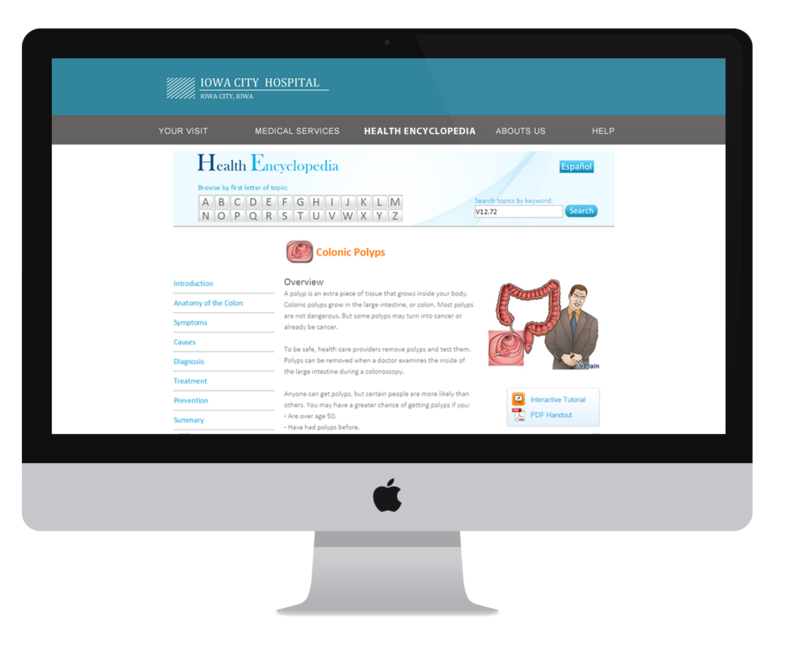 The patient portal often uses diagnostic data from the EMR system to pull relevant X-Plain content. If the EMR system and patient portal are connected, the patient's medical coding will automatically bring up the relevant X-Plain topics. If the patient portal does not read the medical record of the patient, users can search the X-Plain Health Encyclopedia embedded in the patient portal. All X-Plain topics, including discharge instructions, are included in this solution. Each topic comes in the following educational formats: videos, tutorials, handouts, full text, and overviews. You can select a subset of these formats if you don’t need all of them. We offer topics in English, Spanish, and Arabic. The client decides who should host the content. If the content resides on the hospital servers, updates are delivered periodically to the content manager. If the Patient Education Institute hosts the content, updates become available automatically. Is there a learning curve for healthcare staff? Healthcare providers just need to inform patients of the availability of the patient portal service. What is the learning curve for patients using X-Plain? The learning curve for patients is minimal. The most challenging part for many patients is remembering their patient portal login information (username and password). On a smartphone, retinal or fingerprint identification can help with this. 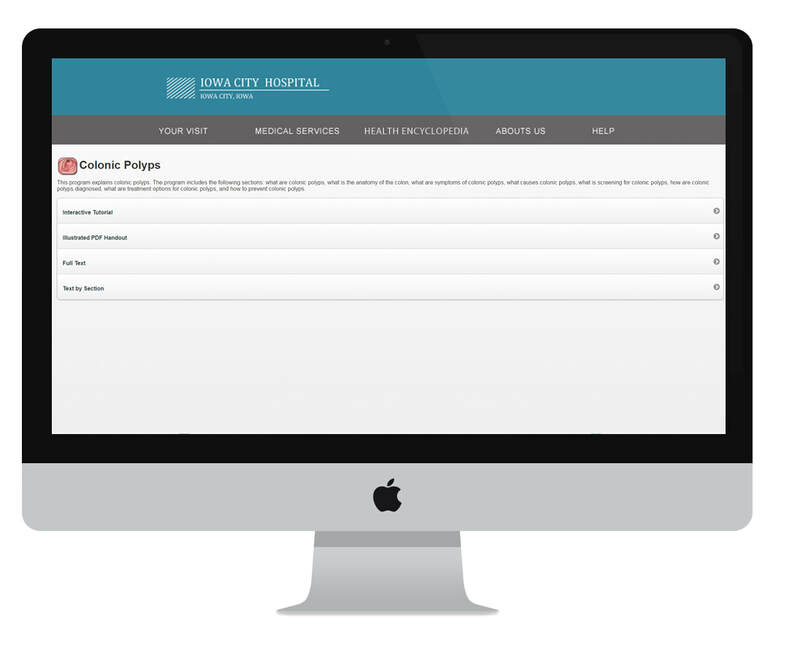 Once inside the patient portal, the patient simply clicks on the Infobutton next to each condition or treatment. The multimedia programs are also very easy to use. There are usually only two options on-screen, such as advancing to the next slide or reviewing the previous slide. What kind of information does X-Plain for Patient Portals document and how is private health information treated? X-Plain for Patient Portals can document when a patient watches a video or completes a tutorial. This type of documentation is usually a functionality of the patient portal itself. Ask your patient portal technician or vendor for more information. Most patient portal vendors allow us to brand our content with the client's name and logo. Ask your patient portal technician or vendor if this is an option or contact us for more details. Can I send reminders to the patient to review their discharge instructions? Yes, this is often a functionality of the patient portal itself. Can I modify the content to add specific details about my hospital? Healthcare providers can modify the textual content within the EMR itself. Many EMR systems allow providers to modify, save, and send discharge instructions to the patient portal. Ask your EMR technician or vendor or call us for more information. Yes, X-Plain for Patient Portals is sold as an annual subscription. Content updates and implementation assistance are included with the subscription fee. You can cancel the subscription at any time. Yes, we offer a 30-day free trial. You also need the approval of your patient portal technician or vendor. Do you offer any add-on services? ​We also have a library of 10,000 medical illustrations. If you have developed in-house patient education content that you want to include in your patient portal, you can enhance it with X-Plain images and photos. ​the [average person] about frequently occurring problems." "Excellent self-teaching program. I will recommend it to my friends and family. Everybody needs this!"